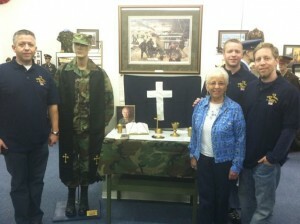 Jerry Young’s three sons, along with Loreen Young, pose with the military items donated to the museum by the Young family. Jared Young is on the left, Justin is behind his mother, and Jason is on the right. 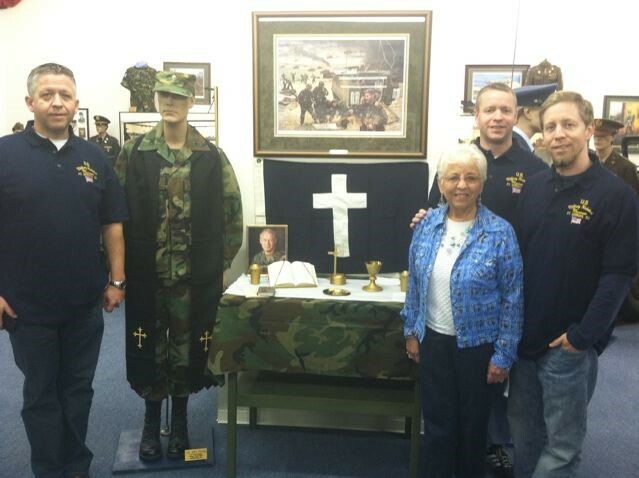 Loreen Young, wife of the late Dr. Jerry Young, has sent along this photo and report of some friends who operate a military museum, to which the Youngs donated artifacts from Jerry Young’s military career as a chaplain. “He asked me if he could have some of Jerry’s military things for his museum so the week they left I got together some things, the first I have had the courage to part with, and gave them to him. I asked my three sons to join me last weekend in Colorado to see their dads’ things on this display and we were thrilled to see this right inside the front door. The museum is located about 70 miles northeast of Denver in a small town of about 12,000 population. Jerry Young, who died in December of 2010, was the senior pastor at Lititz (PA) Grace Brethren Church for 33 years. He also served as a chaplain in the US Army Reserves for 33 years and achieved the rank of colonel. Hi, Lorene, so glad Jerry can be remembered in this way. He was a wonderful friend, pastor and soldier. You and your sons look great. Trust you are doing well. Love, Judi and Marlin. A great honor to a faithful servant of the Lord and a servant leader to our soldiers! Thanks for celebrating his life by allowing the world to see his tribute to the ministry for the Lord and the U.S. Army. Thanks for our Eagle Commission in thier continued support for the Chaplincy in the Armed Services! Thanks for his service and sacrafice for our nation! Loreen, What a wonderful tribute to Jerry! And a great way to share the valuable, but often unrecognized Chaplain ministry. Loreen, Thanks for passing along this photo and article. What a great way to share a bit of Jerry with visitors to the museum. I'm so glad we had the privilege of knowing him and your family. You must have been so thrilled to see the exhibit with your 3 special guys!